Welcome to the SureStay Plus Hotel by Best Western San Antonio SeaWorld, a great hotel near SeaWorld where you'll have a great San Antonio experience. 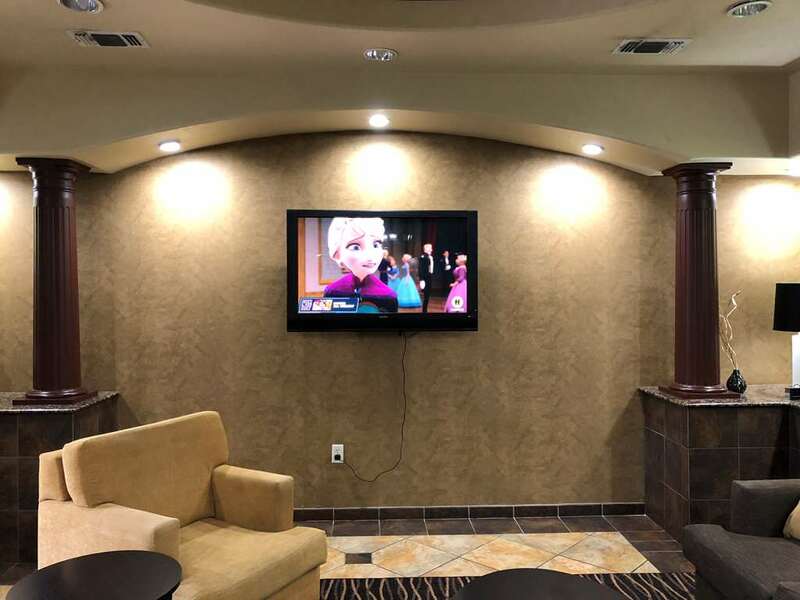 This affordable San Antonio hotel is also located near Lackland AFB and many other attractions and points of interest. We're a smart choice for students and parents wanting to stay near the University of Texas at San Antonio. We're also the right place to stay while visiting the San Antonio Zoo and Aquarium, Six Flags Fiesta Texas, the famed Riverwalk, the San Antonio Missions National Historical Park and San Antonio Botanical Garden. Our location puts us close to I-410 and State Highway 151, a convenient place to stay no matter what part of San Antonio you want to explore. Even the historic Alamo is easy to reach when you stay with us. If you're in town on business, you may want to take advantage of our meeting room, which can accommodate up to 80 people, and our business center. We also feature guest laundry facilities, valet cleaning services and much more. We provide free coffee and tea in our lobby at all times and also offer free full hot breakfast, Wi-Fi, weekday newspapers and a relaxing heated indoor pool. You will discover that our guest rooms feature unique and modern elements and a signature shower as well as a refrigerator, microwave, flat-screen television, iron with ironing board and more. We sincerely hope you make our SureStay Hotel by Best Western San Antonio SeaWorld in San Antonio your home away from home while in Central Texas. We take real pride in offering a great guest experience at an affordable rate and we look forward to serving you. You can be sure that we'll be here when you need us if you book now. We look forward to meeting you. Garden - 15 mile(s) from San Antonio Botanical Garden, scenic, 38-acre area with trails, a pond, roses & native plants, a glass conservatory & a cafe. 1 mile(s) from Westover Hills Shopping, Payless, Sprint, Radio Shack, Food court, and many more. 20 mile(s) from Shops at La Cantera, is an open-air regional shopping mall located in the La Cantera district of San Antonio, Texas, USA, near the Loop 1604 and Interstate 10 interchange, on the city's Northwest Side. 15 mile(s) from Witte Museum, was established in 1926 and is located in Brackenridge Park in San Antonio, Texas. It is dedicated to telling the stories of Texas from prehistory to the present. 18 mile(s) from Alamo Mission, is commonly called The Alamo and was originally known as Misi n San Antonio de Valero. 18 mile(s) from Riverwalk Downtown, is a city park and network of walkways along the banks of the San Antonio River, one story beneath the streets of San Antonio. 15 mile(s) from Six Flags Fiesta Texas , is an amusement park. 5 mile(s) from Lackland Air Force Base, is a United States Air Force base located in Bexar County, Texas. The base is under the jurisdiction of the 802d Mission Support Group, Air Education and Training Command and an enclave of the city of San Antonio. 22 mile(s) from Natural Bridge Wildlife Ranch, is a 400-acre safari park on the northern outskirts of San Antonio, near New Braunfels, Texas. The Natural Bridge Caverns is not affiliated but is located nearby. 3 mile(s) from SeaWorld San Antonio , is a 250-acre marine mammal park, oceanarium, and animal theme park, in the Westover Hills District of San Antonio, Texas on the city s west side. 25 mile(s) from Natural Bridge Caverns, are the largest known commercial caverns in the U.S. state of Texas. The name is derived from the 60 foot natural limestone slab bridge that spans the amphitheater setting of the cavern's entrance. 15 mile(s) from San Antonio Botanical Garden, a scenic, 38-acre area with trails, a pond, roses & native plants, a glass conservatory & a cafe. 10 mile(s) from San Antonio Aquaruim, a small, interactive aquarium offering touch tanks, fish feeding, an aviary & an inflatable play area. 8 mile(s) from San Antonio Missions, are a Minor League Baseball team of the Texas League and are the Double-A affiliate of the San Diego Padres.